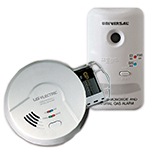 The Universal Security Instruments Photoelectric Smoke and Fire Alarm provides 10 years of continuous protection against deadly threats in the home. The utilization of photoelectric technology allows for increased efficiency in detecting slow smoldering fires. Perfect for new or replacement installations, this maintenance-free alarm is suitable for houses, apartments and mobile homes. The sealed battery (included) will never have to be replaced throughout the life of the alarm, giving you a decade's worth in peace of mind even in the event of a power outage. 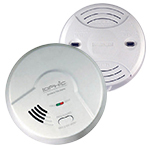 The perfect replacement for existing Universal Security Instruments Alarms, this smoke and fire alarm features a large mounting base to cover imperfections in drywall and the option to replace retrofitting applications. The quick deactivation key switches the alarm off and makes the batteries safe for disposal. Once the alarm is deactivated, the tamper resistant feature turns on to prevent deactivated alarms from being reinstalled. 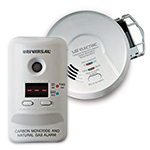 This photoelectric smoke and fire alarm exceeds industry standards by meeting new laws and legislation. The Universal Security Instruments MP316SB Photoelectric Smoke and Fire Alarm is ETL listed to UL Standard UL 217 and is also California State Fire Marshal approved.